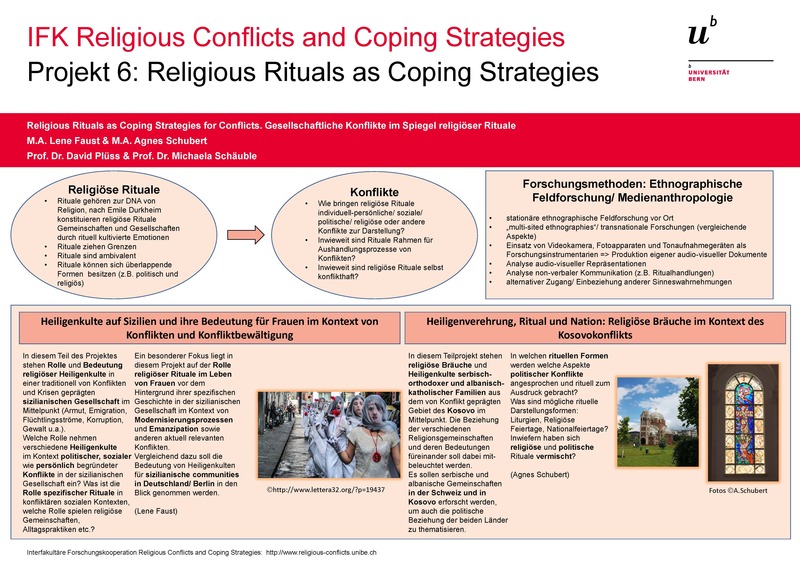 The main aim of this subproject is a critical self-reflection on the epistemological pre-conditions for research on religious conflicts based on a historical-conceptual investigation of the guiding concept of “religious conflict”. The first step will be to problematize the claim of epistemic-neutrality underlining the discourse of “religious conflict”. As an alternative to the model of epistemic-neutrality in the research of religious conflicts, the second stage of the project will consequently attempt to lay the ground for a theory of inter-epistemology. By identifying and defusing structural biases of the guiding discourse, the subproject aims to provide a theoretical contribution to coping with violent religious conflicts through prevention. Religion and spirituality may serve as valuable resources and have a potentially significant impact on health and well-being. Yet, due to the ambivalence of religion, it can also cause severe emotional distress, so-called “religious/ spiritual struggle” (Fitchett & Risk 2009). Religious/spiritual (r/s) struggles imply negative emotions (e.g. anger) and are connected with poorer health outcomes and even psychopathology. 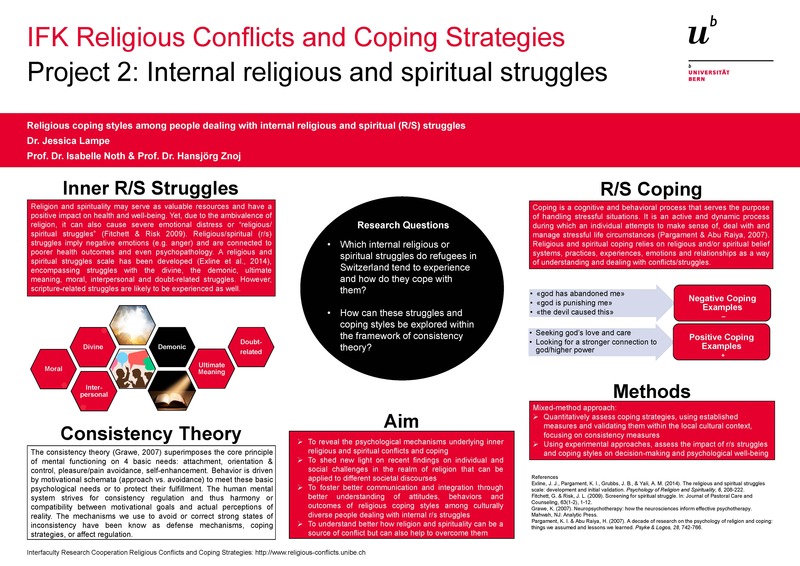 The joint research project between clinical psychology and psychology of religion therefore aims at: (1) identifying specific internal r/s struggles, (2) assessing distinct religious coping styles among culturally diverse people dealing explicitly with internal r/s struggles, and (3) evaluating attitudes, behaviors and outcomes of religious coping styles from people dealing with internal r/s struggles. In recent years, a number of religious practices and related topics regarding the integration of immigrants, have been subject to intense political debate. This project asks whether and to what extent states are justified in legally regulating these issues. Addressing both the theoretical and the applied questions involved, it aims to gain insight into the criteria that are decisive for whether a societally relevant issue can legitimately be legally regulated, to determine and explain the limits of legal prohibitions as well as to find answers to current issues of debate such as the ban of the burka. Is monotheism necessarily a cause of conflict? This project, pushing back against this common assumption, investigates the social and ethical integrative power of monotheist positions, by looking at the way God’s uniqueness is presented in one of the most productive and influential ancient philosophers: Plutarch of Chaironeia wrote in 1st -2nd centuries of our era, as a Platonic philosopher and priest of Apollo in Delphi, about the most diverse religious traditions and phenomena. Our hypothesis is that Plutarch’s project of showing that the many gods and cults of polytheism all lead back to the worship of the one god is aimed at unifying the various religious and cultural traditions in a common religious and philosophical search for truth. In this way, he tries both to grasp the various traditions in their independence, whilst subordinating them to a single system of values. Our project is a contribution to the on-going debate about pagan monotheism, and opens perspectives for contemporary strategies for dealing with conflicting claims to truth, often in a religious context. In multi-layered conflicts with religious dimensions, gender and sexuality play a central, but often under-recognized role. In such periods of societal rupture, mostly contested by male protagonists, opponents are often stereotyped, orientalized or feminized. At the same time women and men from minority groups are often hindered from accessing such negotiations or even denied access altogether. This project examines the importance of both of these aspects in two case studies, focused on significant cultural wars in Western Europe of the past and the present, in which religion has played a central role. Both case studies explore the gendering of the opponent as well as the agency of women. The project will thereby analyse how women (and certain men) intervene in religious conflicts through action and writing and what strategies of conflict resolution evolve from them. This project aims to research and compare devotional practices of the three monotheistic religions – Judaism, Christianity and Islam – with regards to the ritualistic and discursive strategies by which they negotiate and represent religious identity, demarcation and conflict. The comparison is based on ethnographic studies – both in a Swiss city and in an urban context in the Mediterranean – of religious rituals in a conservative Christian, Jewish and Muslim community, in which religiously motivated conflicts are addressed and dealt with. The project focuses on the interrelation between ritual and discursive modes of interaction in central cults. It critically assesses ideas about the three monotheistic religions and the “clash of civilizations” while closely studying contexts in which intercommunalism and conflict management are simultaneously possible and perpetually under threat. The veiling of Muslim women continues to be an issue in the public discourse. In most cases, however, this discourse is not just about religion; rather religious beliefs and symbols are instrumentalized. In modern societies the media provide the main arenas in which controversial issue are publicly discussed. Against this background, this project pursues two aims: firstly, we examine the structure and arguments of public discourse in Switzerland on the Islam in general and the burqa in particular. Secondly, we explore the effects of public debate on the attitudes of the Swiss public. In the reception history of the Old Testament (O.T.) up to the present day, the angry God has often been considered responsible for the violence that occurs through religion or in his name. Parallel to this stands ancient Egypt, an example of a polytheistic tradition in which the anger of the gods plays a very different role from the O.T. Discussion to date has, however, suffered from the fact that the emotional situations and scenarios of the O.T. (like those of ancient Egypt) are interpreted often unreflectively through the lens of the emotional world of the present day, resulting in serious hermeneutic distortions. The primary goals of this project thus include tracing divine anger through the history of its reception, with a focus on findings relevant to those aspects of religious conflicts related to the anger and emotions of God (and men). This involves both correcting mistaken interpretations and revealing the potential of the emotion of anger to end religious conflicts. This project conducts a conflict-theoretical analysis on disputes within Christianity in Late Antiquity, in dialogue between historical and theological perspectives. Of central interest will be the Church councils, which dealt with questions of theological doctrine and the institutional organization of Christianity. Councils represent problem-focused coping strategies by bringing the conflicting parties into direct confrontation in a regulated manner. In sociological terms, councils actively participate in socializing the conflicting parties. The project combines global and regional perspectives as two sub-projects examine four ecumenical councils (post-doc) and the councils of the Donatist conflict in North Africa (doctoral student). The project aims to give a historically sophisticated answer to a question of importance to all time periods: to what extent are councils, as collective forms of confrontation and consensus building, suitable tools for conflict solution? This project aims to study the four Swiss Wars of Religion of the early modern period, namely the two Wars of Kappel, the two Wars of Villmergen, as well as the Sonderbund War. It elucidates the handling of confessional differences, both during periods of escalation and de-escalation as well as in phases when the different religious parties of the Confederacy resumed their communal life. How were confessional differences used by each party to strengthen their own position and how were they turned against opponents to identify them as adversaries? How were these differences finally re-integrated and, in pragmatic terms, made livable for a harmonious every-day life (“the socializing of conflict”)? And finally: Do some argumentative paradigms remain constant, continually re-emerging in a timeless and identical fashion, despite being used in different contexts? This project investigates the history and present practice of the worship of the Tibetan Buddhist protective deities in Mongolia. In post-socialist Mongolia, some of these deities play an increasingly important role in the conflicting constructions of a Mongolian Buddhist identity which is negotiated partly along doctrinal lines such as the soteriological position of the different protective deities. The present project aims to engage with these identity constructions. Research questions include the history and spread of the cult of protective deities in Mongolia, their doctrinal position and different functions for monastic and lay followers in Mongolia, the possible effects of the Dalai Lama’s negative stance towards one of these deities in the context of the identity-building processes of Mongolian Buddhist communities, as well as the implications and influence of the cult of protective deities on the identity politics of the Mongolian state at the interface of the religious and the secular. The project addresses the centrality of the Israel-Palestine conflict – in the perception of those most directly involved (Israelis and Palestinians), of the populations of the Middle East as neighbors of Israel/Palestine in a closer and a wider spatial sense and finally of European societies and international organizations. The way of making sense of the Israel-Palestine conflict and of integrating it into or excluding it from one’s own wider interpretation of world politics differs widely. In the larger framework of “Religious Conflicts and Coping Strategies” this project, taking the Israel-Palestine conflict as an example, seeks to understand and analyze how the naming of contested space on the one hand and the most recent positionality of the conflict in a deeply transforming Middle East on the other hand affect the prospect of a peaceful coexistence and the potential for conflict transformation in the region.